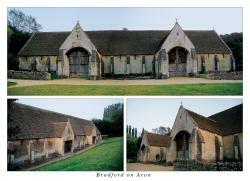 Tithe Barn. The tithe (1/10th) of hay and corn may have been stored for the upkeep of the clergy. Built in the early 14th C, it measures 167.5 x 30.25 ft. and is divided into 14 bays with twin gabled doorways.